I recently read a book, 50 simple steps to save the earth from global warming. Step number 4 states, "Go vegetarian for a day"
How can vegetarian diet reduce global warming? According to a report published by the United Nations Food and Agriculture Organization, the livestock sector generates more greenhouse gas emissions as measured in CO2 equivalent – 18 percent – than transport. It is also a major source of land and water degradation. A vegetarian diet devoid of animal products, is the most eco-friendly diet. A plant based diet, also known as vegan diet is not only good for our health, but also great for our planet because, factory farms intensively confine millions of animals, the toll of such industrialized practices weighs heavily on the environment, depleting resources and contaminating habitats across the world. Toxins, chemicals, gases, and huge amounts of manure from these facilities pollute the soil, water, and air, causing massive environmental degradation. I adore fruit cakes. Growing up, I vividly remember buying fruit cake from bakeries, near my school in Bangalore. Brimming with dried fruits and nuts, fruit cakes from Bangalore bakeries were moist and very tasty. Fruit cake is also called as "plum cake" in India. 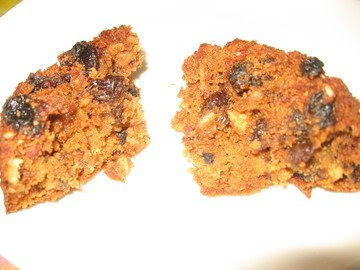 Since I was not a vegan decades ago, I used to relish eating fruit cakes loaded with eggs. Recently I saw a recipe for fruit cake in one of my favorite food blogs, aayi. I was very happy to find a fruit cake recipe which was very easy to veganize. I used soy garden natural butter spread instead of butter. bakeries. I'm sure I will often make this cake. To my mind the life of a lamb is no less precious than that of a human being. I should be unwilling to take the life of a lamb for the sake of the human body. I hold that the more helpless a creature, the more entitled it is to protection by man from the cruelty of man. Today is India's independence day. Mahatma Gandhi played a key role in India's freedom struggle. The principles of ahimsa - nonviolence, initiated by Gandhi was the foundation for India's freedom struggle against the British. Mahatma Gandhi led a very simple life. Gandhi ate simple vegetarian food. Gandhi not only worked for the welfare of human beings, but he also wanted all the living creatures across the world to be happy. To know more about Gandhi visit website1 and website2 . there will be many vegans in India, if many diary alternatives such as rice milk, almond milk, soy butter, nut butters, vegan chocolates and vegan ice cream is widely available.